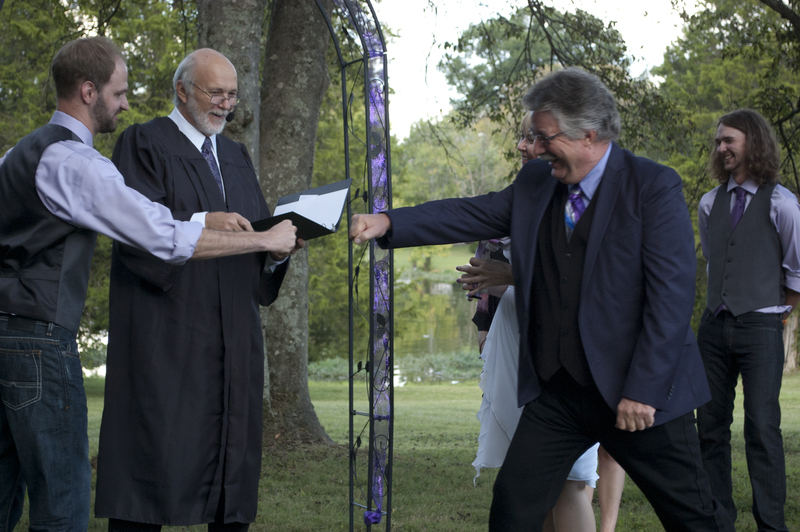 Justin and I knew from the beginning that we didn’t want a traditional wedding, and that included the ceremony. We wanted it to be personal and unique to us, but weren’t really sure how to go about accomplishing it. Very soon after getting engaged, we decided we wanted the whole wedding to take place at one location. But who to officiate the ceremony? Neither of us was really crazy about having a stranger up there marrying us but we don’t know anyone who could legally do it. We researched non-religious officiants and I sent him a bunch of links to look at, and then he came back to me with an idea that I had proposed long before we had even been engaged: what if my Uncle Mike did the ceremony? We blame Uncle Mike for introducing us, after all, so it would be a nice full circle to have him marry us. Plus, he’s a professor and a great orator. He’d be perfect. One little problem. After scouring the county clerk website and talking to several people on the phone, I learned that Tennessee does not recognize the credentials of someone ordained on the internet, unless they can prove that they have an actual congregation. This did not deter our decision though. We decided we’d just get the legal part done at the courthouse the week before and then Uncle Mike could still be the master of ceremonies. We sent him a lot of links to cool, non-traditional ceremony scripts we’d seen online, and told him we just wanted it to be really personal and short, if possible. We went over to his house a week before our big wedding to go over what he’d come up with and I nearly cried when I saw it, it was so beautiful. I hadn’t known what to expect, but he had written everything from scratch, from his heart. It was perfect. One thing that was important to me was removing the sexism from the whole thing (just the bride walking down the aisle – both people are getting married! not just her! ; the whole father giving away the adult daughter; the “you may now kiss the bride”; anything about being subservient; the whole Mr. and Mrs ______; etc.) We decided that we’d both walk down the aisle with both of our parents. We’re adults, we’ve been on our own for a long time, we’ve been living together for a couple years, we don’t need anyone to give us away so by choosing to walk down the aisle with both of the people responsible for turning us into the people we are today, it felt much more modern, more true to ourselves. Family was a big part of the ceremony, so we had them all stand up there with us for a while, which felt special if a little crowded. 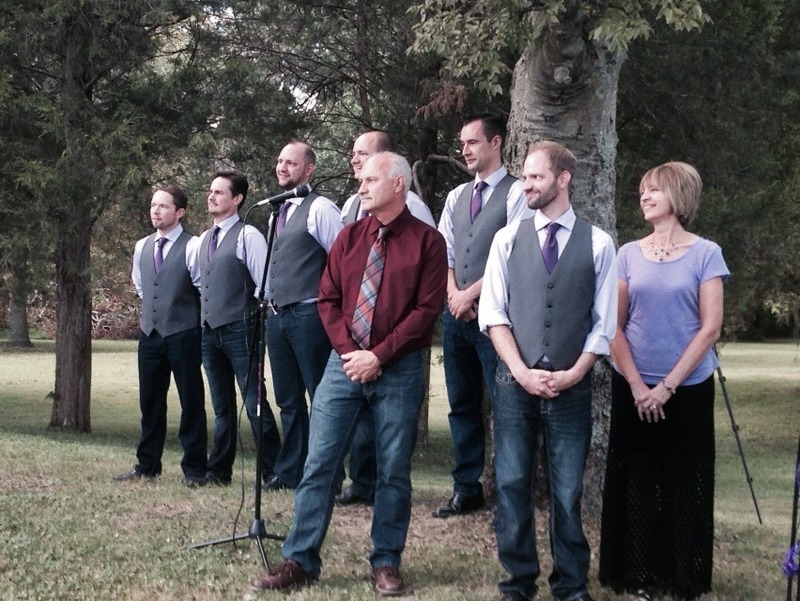 We also included our brothers in our wedding party – his brothers on his side, and my brother on my side. It made for an uneven number of boys and girls but why does it just have to be men vs women? It’s the groom’s attendants and the bride’s attendants, so it was important to me to have my brother with me. I also didn’t have a maid of honor – we’re all nearly 30, not young little maidens. Justin had a best man, and I had a best lady. 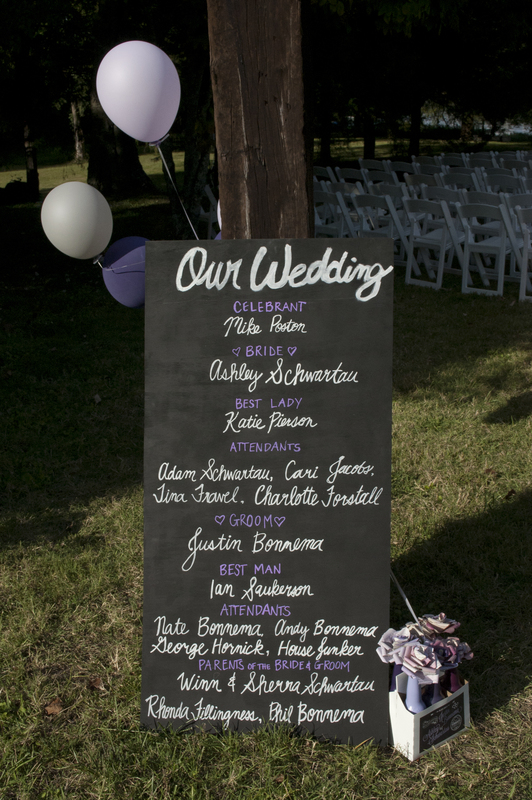 We also changed the end of to “seal the commitment with a kiss” (which we totally stole from our friends’ wedding the month before), and had us introduced as a new family using our full names – Justin Bonnema and Ashley Schwartau (since neither of us changed our names). Overall the whole thing was representative of us and our relationship, I think. 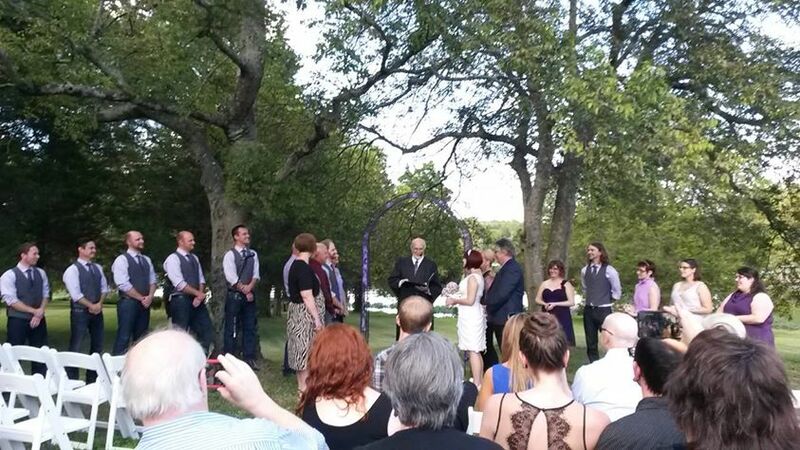 Below is the script of the entire ceremony, including the two readings, our vows, and what we each said during the ring exchange. We went a little off script but those moments were some of my favorite. The whole thing was really funny and fun and touching and very us. Of course when today was chosen many month ago, we had no idea what the weather would do, especially here in Nashville. So, we’re thankful for that cooperation. Since I’ve never done this before, I hope you don’t mind if I ‘Wing It” a bit, because in this technically savvy family, this would be a lot easier for me if I had a laptop and a PPT, but since Winn wouldn’t spring for the HD projection system, I guess we’ll have to do this the old fashioned way………………called ANALOG < for the techies > . And since we are all ANALOG, …that means I don’t want to hear any cell phone going off, or I might have to collect them until the end of class. While we’re standing, I’d like to ask Justin’s Step-Father, Bob, to offer the blessing for this marriage. First thing that I need to do is I need to ask those directly involved if this is really what you want to do. Ashley, despite all his faults, dark past, questionable decisions, and his obsession with sports and Budweiser, is this the man for you? Justin, you know they say when you marry someone, you marry their family. In spite of all of the drama, issues, and personalities in the Schwartau house, is this the woman for you? As you’ve all witnessed, we’ve broken with tradition, and Ashley and Justin have come down the aisle with their parents. And although it makes for a crowded alter area, never-the-less, it has huge significance. Families and Family Life are really at the core of our existence. We learn to be people because of our parents and families. So, its important that the parents participate AND share in the joy of this marriage. Justin, since you win in the Number of Parents contest, I’ll ask all of your parents: < Rhonda, Bob, Phil, & Dawn .> , I know that this ceremony might be a bit different from what you’re used to, but different is not necessarily bad, in fact, in can be quite Good! So, with that in mind and what you now know, are you prepared to accept Justin’s decision to marry Ashley Schwartau, and welcome her into your family as one of your own? Winn and Sherra, first of all, we would like to thank you for opening up your home and making this special occasion very personal for Ashley and Justin. So, I’ll ask you: ‘Are you ready to give your daughter to, and accept this man known as Jason, Justin, or whatever his name is, Bonnema and welcome him into your family as one of your own? I made reference to this point last year at my daughter’s wedding that after all of the parenting, teaching, praising, scolding, grounding, tears, and hugs and love, our Goal as parents is to teach them how to make proper decisions. We might give a little advice, if asked, about buying a house, buying a car, what school to attend or even what career path to chose. But all of those decisions are secondary to the decision of choosing a life long mate. That decision rests solely with our child. Its at that moment we witness our child transform into an adult. And we smile. I must say that I was little stunned when Ashley and Justin asked me to officiate their commitment to each other. But after the surprise wore off, and the bourbon started kicking in, I felt very honored to have this opportunity. Playing cupid had not crossed my mind when I asked Ashley and her Mother to bring something over to me at Mayfield Mastering one day. I had no idea what was going on Ashley’s personal life. I had been working with Justin for a couple of years, and had countless ‘guy’ conversations about sports, beer, and occasionally relationships, AND Justin was emphatic that relationships were not on his radar. But when Ashley walked into the control room, Justin’s eyes were at attention and he had that ‘Look’ on his face. Little was said after they left, but I was certain that there was some magic that first day. Justin was focused on student loan debt, the Dallas Cowboys, and Budweiser. Ashley was trying to get her feet on the ground with her new Digital Media degree, and having spent a year in Paris learning to speaking French as a second Major. But from that day on, all of that parenting on how to make proper decisions kicked in, and nature took its course. Growing up, Ashley was always a little afraid of me, because I was this big scary man, but she always listened closely when I spoke to her. I think I broke some of the ice when I taught her to tie her shoes. The one thing I’ve always noticed about Ashley is that she always had / has a smile on her face because she enjoys life and gravitates towards things that make her happy. And here she is today, still smiling and I think very Happy. Justin’s boss, John Mayfield, who unfortunately couldn’t be with us today, had been struggling with interns and apprentices at his place of business and was about to give up when Justin showed up one day, and he told me “I think I found a good one!” I had an office at the studio and was handling all of the technical issues there. I enjoy teaching people that want to learn, and Justin wanted to learn. Justin had been to school in the art of recording, and was there on every issue with eagerness. John and I would discuss Justin’s eagerness, but also something important to John and me, and that’s Character. Good Character is indicative of a good family. In due time, we found that Justin does comes from a good family. All too often, people get caught up in the planning of a wedding, and I prefer to stay out of that. I want to know about the Marriage. Marriage is much more than standing up here exchanging rings and saying ‘I Do’. Marriage is accepting that person just the way they are today, without change. It’s a symbol of the promises you’ll make to each other today and in the future as you continue to grow stronger as individuals and as partners. Marriage in its most basic form, is the birth of a New Family. At this point, you think you really love each other, but in reality, you’re just scratching the surface in the cultivating of that new family. Its just the first stepping stone on a journey down that ‘Yellow Brick Road. It’s a long journey of friendship, commitment, laughter, tears, adventure, and responsibility. Several years from now, you’ll wake up one morning and realize what Love really means and that you’re living in the land of Oz, because you’re with your Soulmate, and you’re with your Best Friend, and you’re truly In Love. Most importantly, You might be surprised what a simple and sincere ‘I’m Sorry’ will do. For this commitment, Ashley and Justin, being accomplished writers, have written their personal vows in secrecy and would now like to give those Vows to each other and share them with all of us as witness. We officially started dating in May of 2009, and a few months later I wrote the following words in my journal: I can’t tell anyone but this is the man I’m going to marry. I didn’t want to tell anyone because at the time, I still thought that being in love was a weakness. But over the last five and a half years, I’ve learned a hundred times over, that being in love is not a weakness. Loving you makes me strong. And I can only hope that, as we get old and wrinkly and I have a hip replacement or two, that I will be able to show you how much I love you, to make you as happy as you make me. You put up with my whining and screeching and bed-hogging; you kill all the spiders and always mow the lawn; and you love our cats as much as I do, some days I think more, which is saying something. You calm me down when I’m stressed and hold me when I’m sad, but most importantly, you love me with all of your heart, which you show me through your patience, affection and kindness every single day. And I’m going to spend the rest of my life trying to return the favor. I promise to support you in your ambitions, to encourage your hobbies, and to push you when I know you can do better. Because you can. I promise to get better about shutting the cabinets, not to fuss so much over the clothes on the floor, and to make sure our fights are fair. I promise to love your family as my own, respect your bromances, and give you plenty of alone time. I’ll even bring you beer from the fridge if you ask nicely. I promise to hold sacred the season known as Football, and never make plans on Sundays, Mondays and Thursdays, unless unavoidable. Like tomorrow. Sorry. I promise to be your confidante and biggest fan, your co-wine taster and TV binge watcher, your lover, your helper, your friend, and now forever your wife. I promise to give you all the love, respect and attention that you deserve and to stand by your side proudly for the rest of our lives. A great man once said it is our choices that show what we truly are. In this moment, as we choose each other, I hope that our friends and family see not just two well-dressed people, but two people in love, two people choosing to commit to an ideal, choosing to work hard at something that matters. You always ask if I had to pick between you and the cats, who would I pick. Despite what I usually say, you are always my favorite and I will always pick you. Because you, Justin Ray Bonnema, are my choice. And I will choose you every day for the rest of my life. If I recall correctly, the first conversation we ever had was an argument. Not really an argument in the sense of a fight, rather a back and forth banter, that six years later still serves as the main format of our conversations. But we have to give credit to that flirty little exchange that took place back in 2008 and the subsequent curiosity born and raised in its outcome. Of course, I would be lying if I said that I knew then that we’d be here today. That our interests would mold us together, regardless of their differences. To borrow a cliché, this was not love at first fight. I can’t remember exactly when I knew it was love. I don’t think it was any particular event; it was more a collection of little things that were impossible to ignore. Like, the way you could walk into a room of strangers and leave with five new best friends. Or just your general optimism for everything. Or how you won’t allow me to get old. I started to admire your passion for life. For the things you do everyday to the things you hope to do in the future. But even before I fell in love with you I fell in love your family. They accepted me immediately and I’ve never felt so at home when I’m so far away from home. It was those little things that made me realize I had found the perfect counterpoint. Soon I started thinking about you pretty much all the time. And every thought started with I love the way she__________…. laughs, smiles, kisses, observes, plans, dances… loves. As the great Homer Simpson once said about love, “Look, maybe I’m no expert on the subject, but there was one time I got it right.” For me, that time is now. That love is you. And I can’t wait to share the rest of our lives together. And in that time, I’m committed to being the best husband I can be. That no day will pass without the words “I love you”. No night shall fall without the simple pleasure of knowing this is ours. As a team, no problem will be too big overcome. No joy will be too small to celebrate. No spider will be left alive. There are so many great love stories out there. This one is my favorite. The one where a Florida girl and a South Dakota guy met in Tennessee and together formed a spirited duo of thrill seekers, rife with romance and comedy. Together they build a family, whether that be a kid or two…. or just more cats, which is fairly inevitable. And together they chase their passions for as long they are physically able. I want our commitment to each other to serve as a reminder that anyone can fall in love. But it takes a special pair to stay in love for a lifetime. I’m going to make that easy for you. Just as you’ve done for me. So that our love story inspires others to find those three magical words: happily. ever. after. Ashley, I ask that you wear this ring as a symbol and reminder / of my love and commitment to you / in good times and in bad, / as your husband, confidant, and Best Friend. In academia, everything is built on Outcomes or expectations. Now, Justin, I would ask that you personalize this by telling Ashley and her parents in your own words what this marriage means to you. Justin, I ask that you wear this ring as a symbol and reminder / of my love and commitment to you / in good times and in bad, / as your wife, confidant, and Best Friend. Now, Ashley, I would ask that you personalize this by telling Justin and his parents in your own words what this marriage means to you. Now that you’ve made this special commitment to each other, your families, and to all here in attendance, it would be appropriate to seal this commitment with a kiss. I’d like to be the first to congratulate Ashley and Justin on the Birth of their New Family, and to their parents on their newest additions to their families. By the Authority vested in me in the State of Schwannema ……I’d like to introduce the Newest Family here today……..Justin Bonnema and Ashley Schwartau.